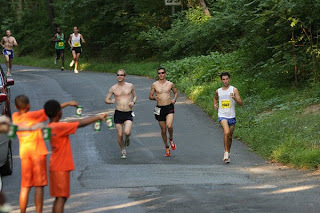 JARRIN runs 23:38 (5:54 pace) at Pacer's Fairfax Four mile run for 21st place finish (3rd in age group). If anyone is interested in doing the National Half Marathon, the race website says it's on track to sell out by Friday. More interestingly, though, there is a half marathon relay I'd love to do. It consists of two 5 mile legs and a 5K anchor leg. The team competition itself isn't particularly competitive, but we could race against the race leaders (65:03 won last year), or at least try to beat Dirk's time from last year (67:37). Presumably we would all need to enter the half marathon before it closes, so let me know soon if you're interested in fielding a team. To those who haven't, please send Jimmy Daly profile information as soon as you can. He needs a written blurb and a (hi-rez) picture of you in GRC garb. For examples, please visit HERE. This should only take a few moments. Please do this soonest. Who is in town and looking for a workout Wednesday evening at BCC? Start pulling strings if you haven't registered, because it has sold out already. Also, Merry Christmas, ya filthy animals. All - please take 5 minutes and make sure your results are updated in the 2010 spreadsheet. This serves as an historical archive for the GRC. These are results you ran while wearing the GRC singlet. I read Jake's blog about Winning or losing some war with his leg and the angst that goes with this effort of running all out. I do think, in all fairness to the body we are blessed with, there is no easy way out. A professional runner or endurance athlete gets a massage every week, goes to the chiro and pt and stretch specialist on a weekly basis, does strength and conditioning work and still gets injured and beat to hell. With this said, unless you are all willing to be like Dirk and succumb to multi sport, steal mike wardian's genes or are willing to nourish the body through these maintenance like efforts, the body will always be at war with the wear and tear that all out racing inflicts. Running for fun or just jogging to burn calories is a more pleasant way to enjoy the activity and causes far fewer disruptions to joint and muscle movement. Alas, it is less fun and does not feed our competitive egos. With this said, I am not sure that competitive racing offers a nice ring of love for our bodies so get used to it. FYI--Ray Pugsely had surgery on his foot last week due to a running related injury. 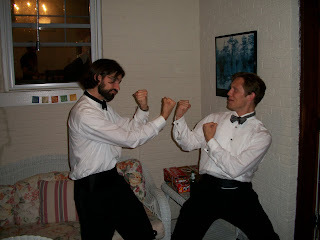 May the new year be a sacred one and learn from Mighty Dirk, the secrets of cross training to improve running economy. Registration for the Shamrock 5k opened this week. It's $30 until 12/31. If you plan on running this, I encourage you to sign up today. This race sells out fast and they don't take pity on fast runners who miss the deadline nor do they provide comp entries. This is a PR course. Last year's winner ran 14:29, I ran 14:48, Murphy ran 15:30 and Huge ran 15:50. There is free beer post-race and then Marren takes everyone to his favorite Baltimore haunts and/or I arm twist Ryan McGrath/Falls Road into having a party. In any case, this is an all around great race. A lot of few runners showed up this year, and a lot happened to everyone, except Towpath, unless you count getting action like he'd never seen before as "a lot." We gained Dave Burnham, Jimmy Daly, Matt O'Brien, Chuck Kacsur, Ian Hankins, Scott Koonce, Jordan Snyder, Paul Guevara, Jerry Greenlaw, Ryan Hason, Sam Luff. We lost Chris Sloane, Dylan Keith and Jake Klim (for the summer and fall). 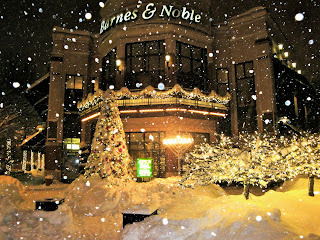 Love, and snow, is in the air- JARRIN marries Pilar soon after buying the ultimate party house. 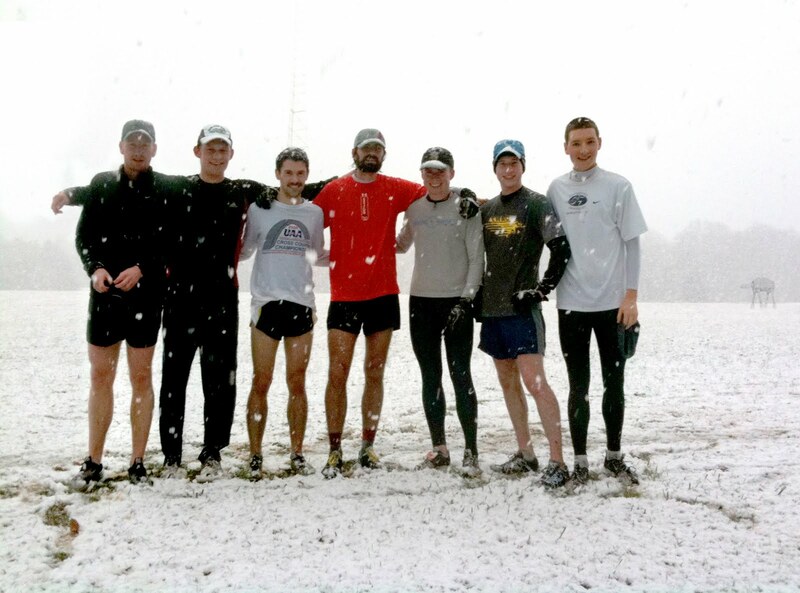 weeks later by dominating the Al Lewis 10 miler in a blizzard, winning by 80 seconds. He later appeared in the pilot for an ambush interview series. Various networks pass on it. His plans to start procreating wreck havoc with our GRC women's team, one-third of which was his wife, Emily. Meanwhile, a vicious storm belts the Washington metro area, dumping more snow than the municipalities are equipped to handle. 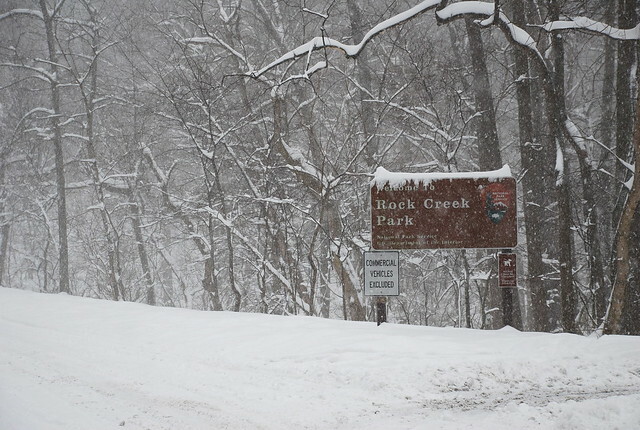 A four-and-a-half-day federal government closure causes many other employers to follow suit, and that leaves many GRC runners with ample time to train, albeit in the snow. Korean superstar- Chris Bain wins MCRRC Athlete of the Year. 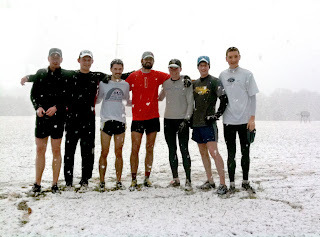 Skinny Jesus- Jake Marren had his way with some great marathon pace workouts. Later proposes to Ella, who accepts. Then he batters Charlie about the head and face. 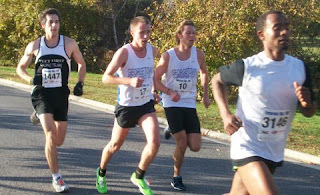 Flying Dutchman- Dirk De Heer EASILY put together the best single month on the team this March, with a win at the Van Metre Five Mile in Ashburn, which also featured a PR for Jake Klim. He followed it up with a third at the St. Patrick's Day 8k and a 5th in 1:07:37 at the National Half Marathon with the wind in his face. Because they wanted to get out of Baltimore before VD catches them- Klim, Murphy and Hughes posted some fast 5k times at the Shamrock 5k. Earning his tenders- Andy Sovonick runs 15:45 for 5k at the University of Maryland Invitational and later qualifies for world duathlon championships. The Spring of Klim- The Red Fox continued his tear through the racing circuit, finishing ahead of some kid named Outlaw who forgot a watch at the Cherry Blossom race, lowering his 5k PR to 14:46, and leading the team at the Shamrock 5k, Cherry Blossom, Pike's Peek and the Broad Street Run. More blossom facts- Sam Blasiak and Kyle Smits showed up for Cherry Blossom, and did they! As did alumni Patrick Reaves and Billy Askey. I guess all the biking is good for something- Matias runs a big marathon PR at Boston- 2:34:40 for 117th overall. 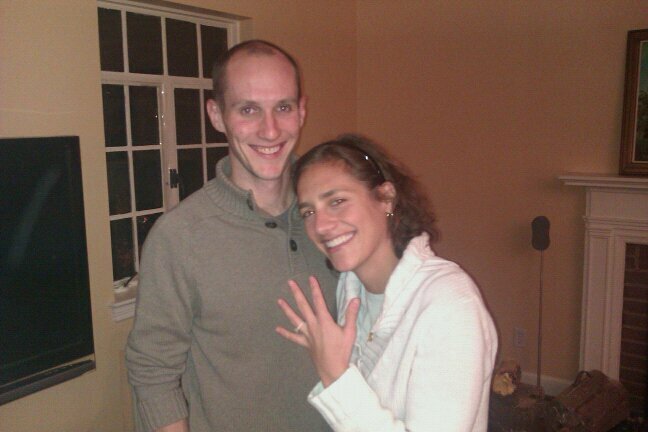 That performance gives him the confidence to propose to Katie Davison, who accepts. Matt Ernst PRs. has a miserable race. In Frederick, HUGE hallucinates that Shalane Flanagan encourages him to finish his race. Turns out it's now-Hansons runner Molly Printz, who vaguely resembles Flanagan. Mrs. Wiegner, a native of Hopwood, Penn., makes dinner for the Broad Street GRC crew, which is reportedly delicious. 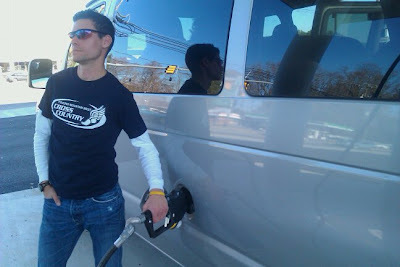 JARRIN and Pilar run the blisteringly hot New Jersey Marathon, suffer heinous sunburn. Bye, Dustin- Dylan Keith heads across the country to grad school in California. He'd be back with us for Chicago, though. Meanwhile, Towpath gets his own place, and proceeds to get more Tang than an astronaut. Sharp dressed men?- Any hope for a team dress code went out the window with Scott Koonce joined the GRC team. Chuck wrecks himself- Most likely a result of not checking himself, Chuck "Big City" Kacsur suffers a freak accident that takes him out of training for a while, but not before running a 1:56 800m first race. Dog things happy for him- Dave Burnham wins the Crossroads 17.75k in 1:03:37. The local newspaper reported that his wife, Sarah, was the third woman across the line in one hour and 21.05 seconds. You get what you pay for with newsroom budget cuts. "The hills in the second half hurt a lot," David said. "I didn't know what to expect. I've never been out there a lot." Didn't stop for cupcakes- Wiggy runs 24:52, in weather so hot it makes you wish you put deodorant on your private parts, to win the 2nd GRC Father's Day 8k. He finishes ahead of 194 other runners. Georgetown Cupcake, Skinny Water, Bethesda Bagel and Whole Foods Market provide refreshments. Chris Raabe returns to Grandma's Marathon and runs 2:17:43. His 2:15 win at the same race (by three minutes) in 2009 made him Let's Run.com's number 10 marathoner of the year. "If too many people know your name, change it. Then change it again. "- Puff Daddy- A Texan via the University of Alabama, Paul Guevara, wanders up to the store and winds up on the team a few weekends later. time that would be worth about 1:11 for a half marathon. He later writes a preview for a half marathon near his newspaper office after running the course, a thought that leaves his editors incredulous. 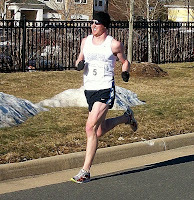 Michigan Paul runs 52:52 for 37th at the USA Ten Mile Championships. Driving rain makes me wet-Dusen leads team at the Parks Half Marathon in a deluge that puts large stretches of the course under water. Muskingum 10k ace Ian Hankins makes his GRC race team debut. Goodbye, Sleep- Karl and Emily Dusen welcome their daughter Lily to their home, forcing Wiggy to find somewhere else to live. Running along traffic was fun- Wilson Komen finishes sixth in the inaugural Wilson Bridge Half Marathon, with Jordan Snyder finishing as third master. Twin Cities Triumph- Minneapolis-St. Paul Paul blazes his first marathon, finishing 17th in 2:21:54. The race also served as the national marathon championship. Milk was a bad choice- The GRC Chicago Marathon team, whittled down through attrition in the preceding months, generally had an off day, with Mike Cotterell's steady running to a 10-minute PR being the pleasant deviation. The warm start and brutally exposed last 11 miles were rough on everyone- all of the American men who met the Olympic Trials standard had previously qualified. Former local-ish runner Tim Young, of Fredricksburg, missed the standard by one second. Dozens of elite runners drop out in the closing miles. The temperature was nothing like the great disaster in 2007, but the dramatic difference between running in the shade and the heat took its toll on many. Hughes managed a decent debut and Murphy salvaged a satisfactory race. Doubling Marathons was a bad choice- Ban loses interest in running, body temperature, one mile from the Marine Corps Marathon finish line. Ian Hankins runs a ridiculous first 10 miles, Dave Burnham moves up to lead the team and Jimmy Daly kicks it in for a strong finish. GRC race team, lending years of coaching experience on the university and post-collegiate levels to helping refine our training practices. Big Apple, lanky Kenyan- Wilson runs 2:26 in New York. New web profiles- Jimmy is writing them for you guys, so if you haven't yet, send him your photo and profile text so he can get the ball rolling. Get your act together and you head in the game. What are you doing here, Ryan? 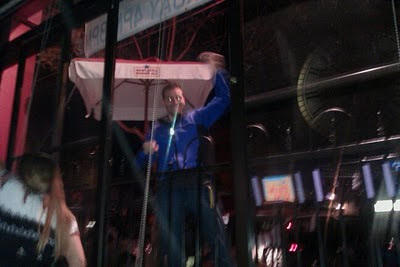 How old did you think this girl was?- Ryan Hanson, host of To Catch a Predator, join the team from Allegheny College. He soon wins the Pittsburgh YMCA turkey trot in sideways freezing rain. 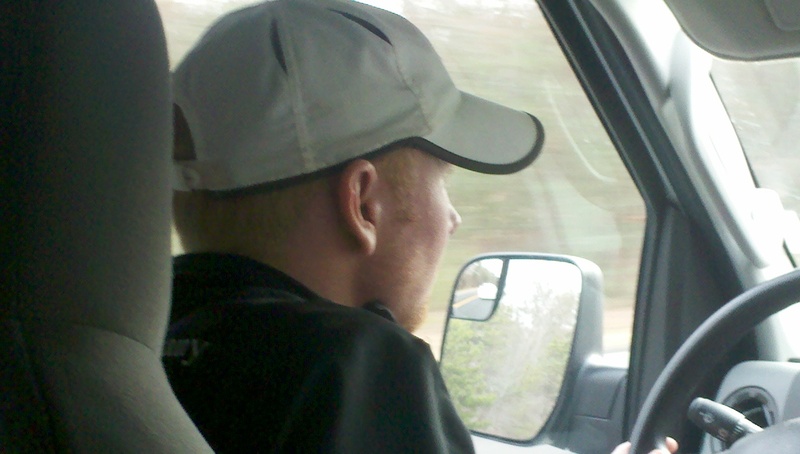 Outlaw moves to Maryland and starts racing with us. Wake up in the morning feeling like L. Diddy- Sam Luff joins the team after years of running in the bitter cold for Cornell University. Wiggy Runs Wild- Joey Wiegner made the roads his plaything starting in October, recording PRs in the 5k and several in the 10k. Prodigal son- Alex Eversmeyer shows up at nationals. His last race with the team? The USATF Open Cross Country Championships in February 2009. This is for all those kittens- Four GRC men finish ahead of Pacer Bert Rodriguez at the USATF Club Cross Country Championships in Charlotte. The team finishes 14th out of 45 teams, improving on last year's 19th place finish in a smaller field. None of the scoring runners from last year's team were among our top five this year, for varying reasons. Few, if any, runners prepared for the race beyond a nominal workout in spikes. 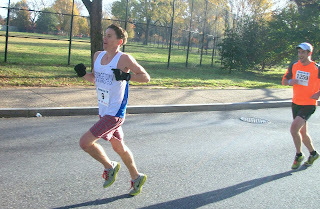 Jingle all the way....to the bank- Wilson Komen, Dickson Mercer, Jimmy Daly and Hillary Cairns win the team title at the big December 10k in DC. I have tomorrow off so I'm going to run in the AM. If anyone else took the day off too and is around, let me know if your interested in meeting up for an easy run. Hanson and I are going to start at 830 tomorrow from the line instead. Be there or be comatose sleeping. If people want to go at 9 we'll swing by. Love you. I need a new housemate. My current housemate is moving out on January 6. The room will come available on January 7. My house is in Aspen Hill and near many hilly roads to run; the room is a 15 x 16 feet big with private bathroom, free parking, share kitchen, living, family, and dinning room. 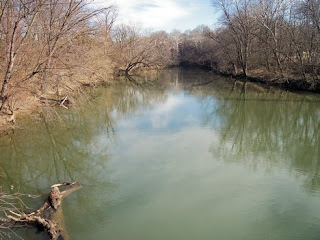 Matthew Henson Trail head is 210 yards or 193 meters from the front door and connects to RCP Trail. It is very quiet and nice area to live. If interested, feel free to email me at eml13297@gmail.com. Thank you. Workout we will be doing is a maintenance workout. 4-5xmile at 5 min pace with 2 min rest. Probably two groups going at this one. As a non-racer, I can provide some analysis, but this was also an excuse to post this team picture taken pre-race. We're holding up the number "10" as our goal was to finish in the top 10. 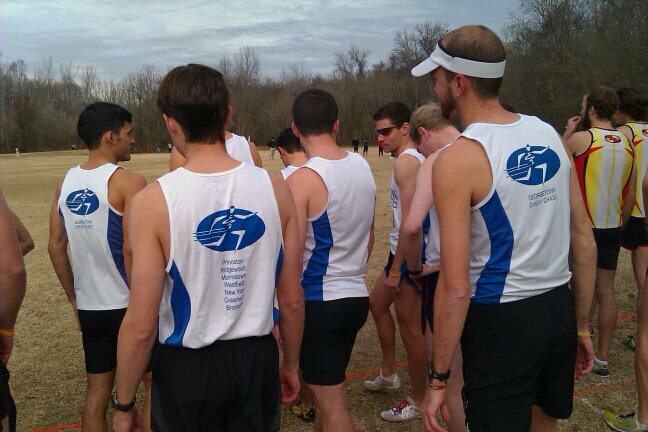 Overall, the team ran very well and our top 4 were within 40-seconds of one another. Wiggy got out hard (4:45) and stayed tough as nails. Hanson ran very smart and seemed to move up throughout the race. Outlaw had an "off day" but still toughed it out and got it done. Wiggy, 'bama Paul and Hanson all ran better or about the same time that they did at flat/fast/ideal course Vet's Day - this is very impressive given this course had 3 good sized hills. 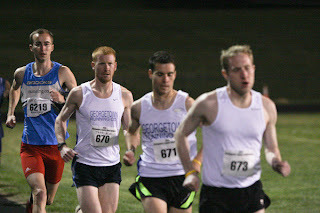 Burnham ran his best race in a GRC singlet and Karl toughed it out to be our 7th man. Not to be overlooked was Jordan's performance in the masters race (35:01). Post and pre-race fun (as you've seen) was indeed a trip. The after party was filled with festive runners and Charlottonians. There was a mechanical bull and there was dancing. Despite the team's great finish (14 out of 45), I am more pleased to report that the team, as usual, really felt like a team as I am sure others will attest to. Next year's race is in Seattle. If we intend to gear up for it, we need to think about possibly holding a second (fall) race to raise additional funding or we'll be shelling out at least $400 each to make such a trip. Huge will be posting some more (professional) pix in the coming days. Please take your time to visit the Pacers running store on P st. down in Logan Circle. It is a great store with a broad selection of all that is worth purchasing in running. They have a great photo of a race start with Mighty Bert and many of our runners on it. What is interesting however, is that someone rubbed off the name of our team on the front of our jerseys so that it appears we are not affiliated with anyone. This is not acceptable and calls for retaliation. Other than that, their staff including the store manager, Rob Wade are all very nice and will gladly entertain anyone with a conversation about running and the greatness of the pacers race team. Strong performances by GRC continues! They crush 2nd place team (Capital Area Runners) by about a minute in the team battle. PUT THAT COOKIE DOOOOWN! 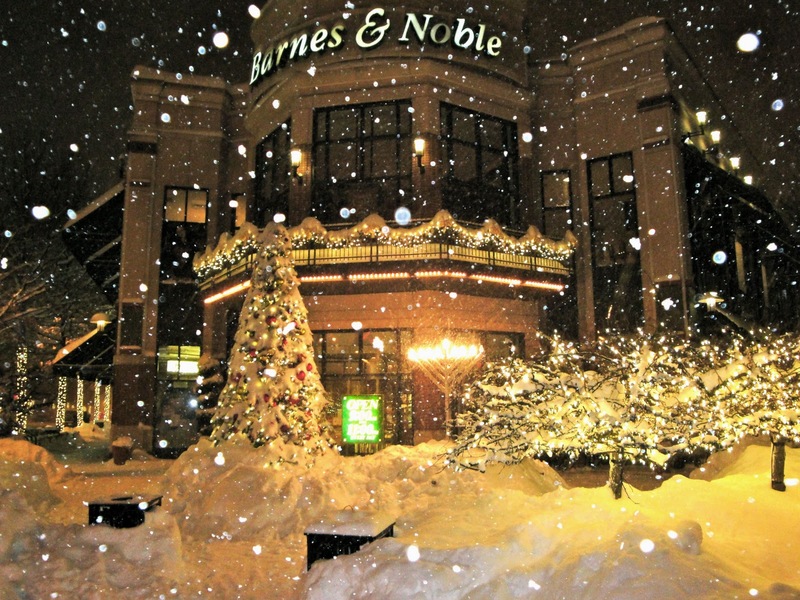 The Sunday run will be from the Barnes & Noble on Bethesda Row at the foot of the CCT. It can be found here. Bain and I will be meeting there at 10:00am. We're looking to do a 13-15 mile loop. Great job today, GRC racing team! With a race the likes of which the GRC racing team put together today in Charlotte, it's hard to see the year come to a close. 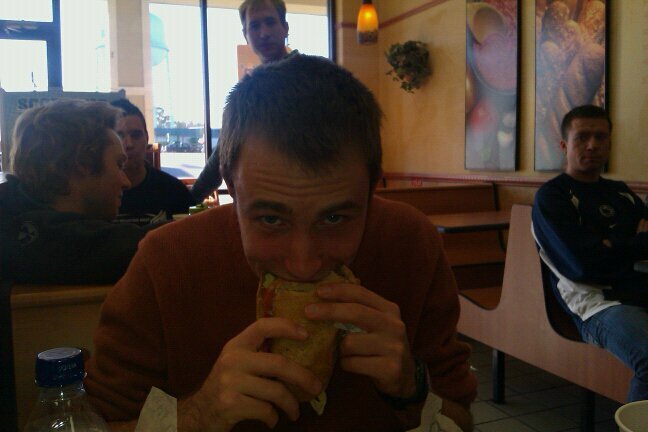 Joe Wiegner closed the year in a markedly different fashion than last year. 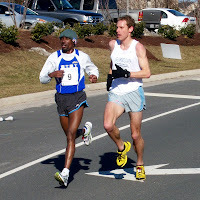 In 2009, forced to work out on his own in advance of the USATF cross country meet, Wiggy injured his achilles tendon, taking him out of the race and away from training for a few weeks. Today, he showed up and led the team with a 61-st place finish in 31:11- a 10k PR. He ran the best race of his life, according to coach Jerry Alexander. 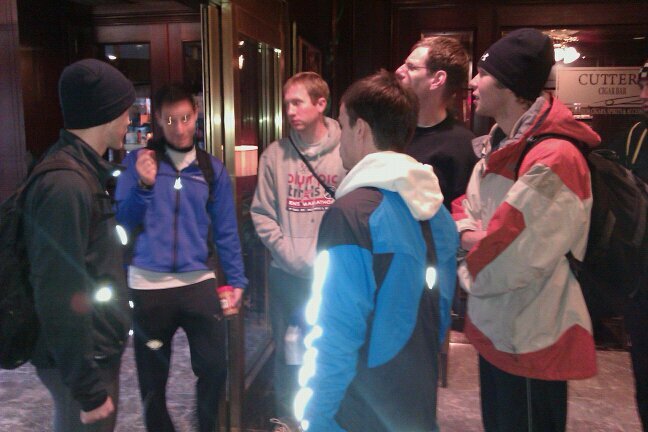 "We went out hard, hung on, had some trouble in mile five, but closed well." Once a miler in high school and college, Wiggy's making the long-distance breakthrough to marathoning next year. Our top five were all out under five minutes, with Wiggy leading the team in the top 40. Texas Paul, Luffy Combs, Hanson and Outlaw all made up a 30-second spread. Dusen comes through three in 15:48 with Murphy and Eversmeyer behind. At four miles the pack was extremely deep. Wiggy could be 4oth, or he could be 60th. Tex, Luff and Hason are behind him, Hansons running on Bert's heels. Outlaw is in fifth for our team, Dave in 6th, Karl moving up. Patrick Reaves was running close to Outlaw. Texas Paul Guevara followed up with 31:32 for 83rd. Tex was reportedly not particularly pleased with his race, but Alexander thought his even racing said a lot about his preparation for the Houston Half Marathon next month. The surprise of the race came from Sam Luff and Ryan Hanson's close finish, 97 and 103, respectively, with 31:43 and 31:47, the latter being Hanson's new PR. Alexander remarked that Luff's smooth form up the hill (a steep affair the racers encountered three times) served him well. Luff didn't race much in the fall, but he blew away any rustiness with a consistent race today. "The course was a fair challenge for guys at this level," Alexander said. "Times were impressive considering the layout." Jerry Greenlaw was disappointed with his 144th place finish in 32:22, but Alexander said the performance was pretty good, considering the mileage Greenlaw has been running lately, as he trained through the race. Former GRCer, now North Carolinian pariah Patrick Reaves finished two seconds behind the Outlaw in 150th. Let's never speak of him again. 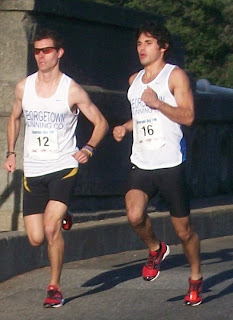 Dave Burnham and Karl Dusen served as displacers at 196 and 198, running 32:57 and 33:00. "Karl had a rough day out there, but he didn't want to let his teammates down," Alexander said. "That meant sucking it up and competing, even though he wasn't in the best shape to do it right now. He led by example by putting himself through pain he didn't have to, but as a leader, he couldn't ask anyone to do anything he himself wouldn't attempt. "Burnham showed there's no question to his ability- if he can find the time to do the training, he'll be up there with the other guys in six months." Partick Murphy ended his long season running 34:27 for 273, just two months after running the Chicago Marathon. "My body is wrecked, though, so I probably couldn't have gone much faster," he said. A week after winning the MCRRC Cross Country series title, Alex Eversmeyer took a day off of beating up on 40+ year-old men to finish 291 in 34:50, one-hundreth of a second back from Billy Askey. Teamwise we finished 14th, well behind the Pacers in fifth, but edging out Charlottesville's Ragged Mountain Running, beating the Manhattan and Central Park track clubs and the Colonial Road Runners. Generally, we finished among the top "part-time" clubs in the competition. When we go back to our jobs as teachers, consultants, engineers and writers/web editors, we are fitting our running pursuits into full and well-rounded lives. Not to say other runners don't also, but to have a pretty good showing against a lot of runners whose professional lives revolve around running is a nice accomplishment. Jordan out well in largest race of day...400 runners. We have just received some Klimtel that the course is "pancake flat and same surface as C&O canal towpath." Running from the store tomorrow morning at 9am. Bain's in - who else? Hello Ladies, I'm not going to run the Jingle All the Way 10k on the Sunday due to a tweaked ankle that won't go 6 miles. If you WANT to run it and have already signed up or have yet to sign up, please contact Jimmy Daly or Max and let them know you're in. Thank you. 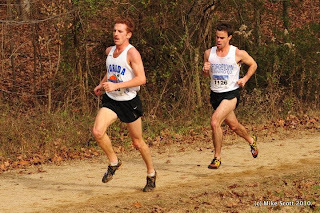 FLASH: The Georgetown Running Company is sending a squad of its best and brightest to do battle at the USATF Cross Country Club Championships this Saturday at McAlpine Creel Park in Charlotte, NC. "This is the best team we've ever sent anywhere", noted one GRCer. 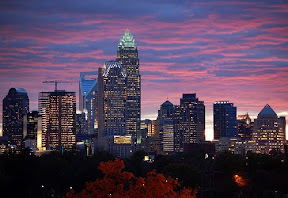 Jerry Alexander, who coaches a handful of the guys going on the trip notes, "While we're not making club nationals a priority, and our runners are training through the race, we should make a very solid showing in Charlotte. Joe Wiegner and Paul Guevera look to be our top 2 men, as both of them have been running excellent workouts and look sharp. 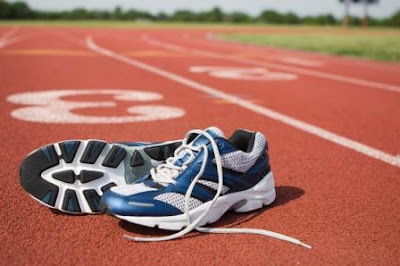 "Ryan Hanson has also looked great in workouts but this distance is at the outside of Ryan's range, and he's looking forward to running fast in the spring at 5000 meters on the track. Sam Luff is rounding into shape and is capable of running well on Saturday. 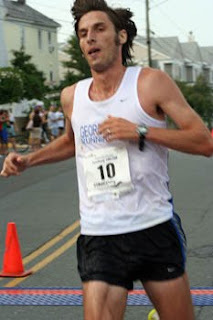 Jerry Greenlaw has been running very high mileage in anticipation of his marathon debut in 2011 and lacks race sharpness right now, but he will be in the mix for top 3 on our squad. When fit, Karl Dusen is our clear number one runner, and while Karl is still recovering from a persistent illness and will not be at full throttle, we still expect him to be a scoring member of our team. And Dave Burnham's PRs demonstrate that when fit, he will be a major factor for GRC in the future, and I look forward to seeing him regain race fitness in the spring." MORE: Pacers, BAA, Atlanta TC, Greater Boston TC, Hansons, Manhattan TC, Bowerman AC, McMillan Elite, NYAC, New Balance Boston among the many teams. I remember Chris Bain when he showed up with Chuck Moeser at races and ran shirtless. I met Shannon through some strange contact and introduced her to the RunCo and look what has transpired. Please note the article below. I ran(literally) into Jim Hage last night on a cold night run. Jim, like Darrel General, is an icon of Washington Running. He was the most dominant force in the area for approximatley 20 years. From The Washington Post Weekend section - September 6, 1996Front Page: What Makes Jim Run? Marine Corps Marathon winner Jim Hage says anyone can put one foot in front of the other -- even you. (Jim Hage runs near the Lincoln Memorial, Photos by Robert A. Reeder, The Washington Post)IN THE RUNNING by Jim Hage In this age of high-tech exercise, when it seems you really aren't working out unless you're sweating over an LED, running is hardly trendy. But for health-minded Luddites seeking to develop cardiovascular strength, tone up or just control their weight, running remains the most efficient choice of exercise.Aspiring runners conjure myriad excuses why they can't incorporate exercise into their busy lifestyles -- even when physical activity is precisely what their doctor ordered. But if the President of the United States can make time to run regularly, why can't you?It's not rocket science, putting one foot in front of the other. Everyone has run at some point, and -- anomalies aside -- most have lived to enjoy its rewards.While for many, committing the months it takes to properly train for a marathon may be overly ambitious in this age of instant gratification, anyone, with reasonable preparation, can run, walk, and/or crawl through a short road race. Fall's cooler temperatures and busy race calendar offer the perfect opportunity to commit yourself to joining thousands of other runners on the road to good health and fitness.But let's start at the beginning. A modest running program of 30 minutes just three or four days a week -- say, the time it takes to watch a few "Seinfeld" re-runs -- will burn fat, fight heart disease and general lethargy, and stand one in good stead at the starting line later this fall. The motivation and excitement of preparing for a race just may spark a healthy and regular exercise program.And maybe you'll learn something about yourself along the way. 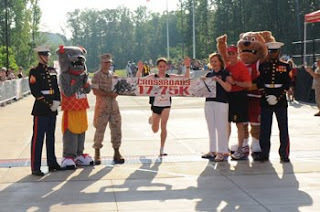 ONE RUNNER'S REASONS-Because I've twice won the Marine Corps Marathon, some consider me a competitive and compulsive running overachiever. Still, runners of all stripes -- including those who struggle through a five-hour marathon -- share the common thread of motivation and dedication inherent in contemplating and then achieving a goal.My own long running romance, now in its third decade, began before high school. Like all youthful infatuations, mine was nurtured by modest success, and tempered by peaks and valleys.Just three months after setting my high school two-mile record in the Maryland state meet, I was cut from the University of Maryland's cross- country squad. One year later, out of shape, I claimed the last spot on the next season's weak cross-country squad. 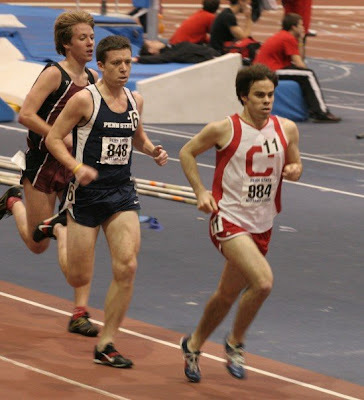 Camaraderie, travel and gradual improvement sustained my interest in inter-collegiate track.I won't say I chose to attend graduate school in Boston solely because or that city's famed marathon, but it was a factor. Once there, and perhaps of the academic drudgery, I ran as often and trained as diligently as I had in college. I found myself enjoying and training more and more. Throughout my first harsh New England winter, I ran on. Not with Forrest Gump mindlessness, nor with the high-mindedness of au courant running philosophers such as "Running and Being" author George Sheehan. Instead, I trained with what I considered a meaningful goal: competing in the Boston Marathon.On Patriot's Day 1981, I ran from Hopkinton to Boston along the world's most historic marathon course, and in the wake of some of the world's best marathoners. Not that I was among them, by any means, but that mattered little to me or the thousands of screaming spectators.Cheered as a conquering hero, I understood how Pheidippides must have felt, albeit briefly, in 490 B.C. when he ran from Marathon, Greece, to Athens to proclaim victory over the Persians before keeling over dead. I shared Pheidippides' exaltation -- claiming a Top 100 finisher's medal -- and lived to race another day.ME AND CAL RIPKENAt age 23 my running had acquired a renewed vitality, and I trained, often twice a day, to improve my performances in road races at all distances. Finally concluding that consistency was key to success, I decided in the summer of 1982 not to skip a single day in preparation for that fall's New York City Marathon. Thus my personal streak of running at least two miles a day began, roughly contemporaneous with Cal Ripken's consecutive game streak. And, like Cal's, my streak continues to this day (although the Iron Man takes his winters off).I've run through 100-degree heat waves and sub-zero blizzards. To keep the streak alive, I've run on ships at sea, in foreign countries at midnight, at high altitude in the Rocky Mountains and in the depths of the Grand Canyon. I ran with my wedding party on the morning I was married, and alone on the afternoon of my divorce.Some days it made no sense to run, due to illness, minor injuries, fatigue, and even real-world constraints, but I can't say that I regret a single run. Many times, it was the best thing I did all day.I improved, to the extent that for more than a year, I earned enough prize money to manage a reasonable living at my avocation. Racing has taken me around the world and privy to cultural differences beyond the confines of guidebooks. In Taipei, I politely declined a pre-race glass of snake's blood. At a race in Milan, half-delirious and desperate for sustenance, I literally and figuratively sucked lemons. I celebrated a better race with the Basques in Spain sharing tapas and drinking wine squirted from animal skins.THE BENEFITS OF MEMBERSHIPI'm just one of 20 million Americans who run regularly for 20 million different reasons. The mystery is why the rest of the country doesn't exercise. Do we really need more evidence that heart disease is the leading cause of death in the United States? Or that overweight and out-of-shape Americans are most susceptible to coronary stress and chronic fatigue?Physical health is the obvious benefit of a regular running program. Unwanted pounds melt away with regular workouts, at the rate of roughly 100 calories per mile. Do the math: 20 miles per week equals approximately one pound of calories burned every two weeks. Does President Clinton eat fast food because he likes it or because he can?The less obvious but often more significant benefit of exercise is enhanced mental health. Besides providing a ready outlet for stress, running helps establish personal control over physical well-being, so that runners develop healthy body image and self-esteem.Those who run already know the simple and irreducible pleasure of loping along a quiet path on a fall morning. They know the release of a hard run at twilight after a hellish day. Runners understand the honest effort required to tromp through new-fallen snow, and the withering effects of a stifling summer run in the city. Runners also realize that it's not never raining as hard as it looks in a car's headlights (almost never). They take exception to the button-downed meteorologist attempting to dictate what they do based simply on the weather.A friend of mine describes his running as "sucking the marrow" from the day. I don't know much about Zen, endorphins or out-of-body experiences, but running allows me to momentarily step off the carousel and into a more dispassionate realm of existence. It is a time for contemplation, free-association and escape, crystallized by physical demand.Jim Hage, who writes about running for The Post, finished eighth in the 1992 Olympic marathon trials and 37th in 1996. His best marathon time is 2:15:52. In real life he's a legal editor at the Bureau of National Affairs. This morning, as I ran, I listened to Flavor Flave and Terminator X. Vintage Public Enemy is a far superior form of music in the rap category, than modern time tunes of this type. I suppose I blame the lack of quality tunes to the invention of Facebook, which, perhaps, has robbed the youth of their true edge. I pray that the race team has powerful, soul enchanting music to inspire them as they take on Mighty Bert and others at the cross country race. An incredible story...about a runner. A delinquent...ran 4:20 in HS...an Olympian...met Hitler in '36...ran 4:07, could have been the first sub-4 minute miler, but went to war instead...crashed into the Pacific...survived on a raft...caught sharks and ate them with his hand...sent to POW camp...beaten, tortured...but won. Carried the Olympic torch in Nagano, Japan. Go to 6:30 in the interview HERE to hear more. If that link doesn't work go HERE and scroll down to Laura Hillenbrand. - Jake Marren runs an illegal beer operation on an island in the Potomac. Towpath has been guarding this liquor lab for weeks. The rest are too embarrassing to reveal on this public forum. How about THE LINE at 9am? 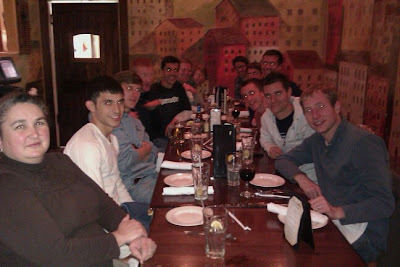 On a more serious note, we have an opportunity to send some runners to Austin on Jan 30th to run a half marathon. Demesse is going but I would like to send a team to go there and win. There is very good prize money. People need to run 109 or better. Wiggy, Texas/Alabama Paul, Jerry the wonder of the world outlaw, Dirk(go back to Texas and win a race), Disckson???? anyway, we can get you a free entry and hotel and maybe airfair(doubtful though). Some of the guys running Nationals are going to a grass field (the "cell phone tower field" in Bethesda) to run a pre-race workout but all are welcome to join. Just be there at 9 tomorrow ready to warm-up. The workout will be a 'follow the leader' fartlek, where one memeber of the team is selected as the leader for that interval and can run up to 1 to 4 minutes on. It is a great workout for team building and practicing matching moves in racing where you don't know how long that move will be either. Jake, can you please provide one of your famous google map links to the location? Please let me know you are running. I saw Mike C. tonight and bet him I would beat him so he must run. 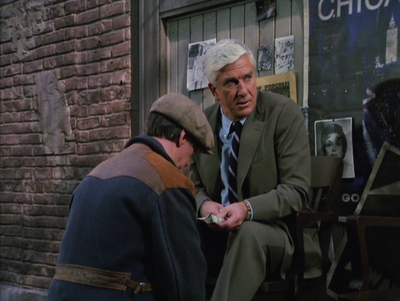 Other than that, please let me know how you are providing your entry to Capital Running Company. I do not want random faxes going there with different messages or wording, etc. Also, in response to Crazy Charlie Ban, the blog has been more or less taken over by the race team but many of the people who look at it are regular rec runners who have a variety of running interests and goals. The end goal of the blog is to promote running and fitness in some form or fashion. wear a hat out there as it is indeed, cold. since it's such a great time of year I thought I'd throw this up on the blog. 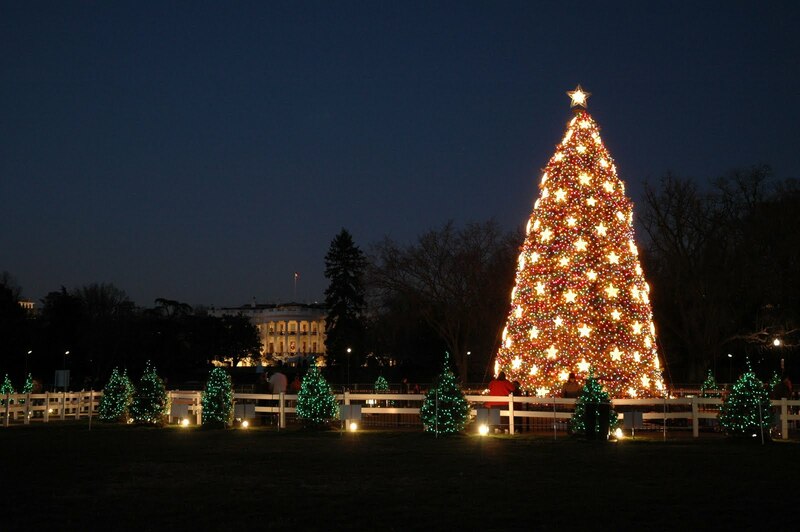 I love this song... Christmas is coming, it is such a great holiday. Let's have some good fun next weekend racing and an even better time through the holidays banging out miles. Saturday I will be doing a progression long run from the TR Island Parking lot at 7:30 AM. I won't be doing the xc workout on Saturday because I have had this workout planned. If you are interested in coming let me know even if it is for part of the run or if you are starting from the store to run at 9. I will be looking to go 18-19 and staying on the towpath for most of it. As most of you know, Coach Jerry Alexander has been coaching a number of guys on the team. 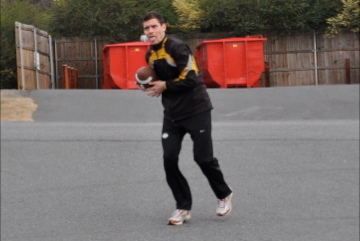 The former head coach of UDC and a former assistant to AU Coach Matt Centrowitz, Jerry lives near B-CC and can be found at the track on Wednesday nights donning wind pants with duel stopwatches dangling from his neck. I personally haven't been doing workouts, but those who have say fantastic things about him and from what I observed, Jerry appears to have great ideas and a sound approach to all things training. I know that Joe, Sam, Ryan, The Outlaw, Karl and others have adopted him as a coach and I've spoken at length with Jerry and plan to hop into his sessions once I'm ready - likely in January. There was a lot of talk about a coach prior to our fall team meeting and Jerry seems like THE ideal fit because he doesn't want to change the current dynamic of the team. He is interested in coaching more of the team, but would prefer if you come to him if you are interested. GRCers who wish to remain self coached or keep their old coach can do that while still running with the team on Wednesday nights and with the team in general (of course!) -- the point of the coach is to help those who want to be coached, not to force those who don't. There is no fee. If you're part of the GRC and interested in Jerry's services, please shoot him an e-mail - coach.jerry@live.com.